So here is my latest project AKA, get this crap out of the Garage..LOL! Its funny how you find things when you do. I have had a bunch of chairs forever and no table. Well, My sister called me one day and told me she was at Goodwill and they had this yellow table for 14.99. She wasn't sure I would like it cause it was yellow and old. I told her to hold it for me. So I get there and this is the table..SHAAAAA of course I LOVED IT!! So I threw it in my suburban and brought her home. It would now join 2 of these three chairs. 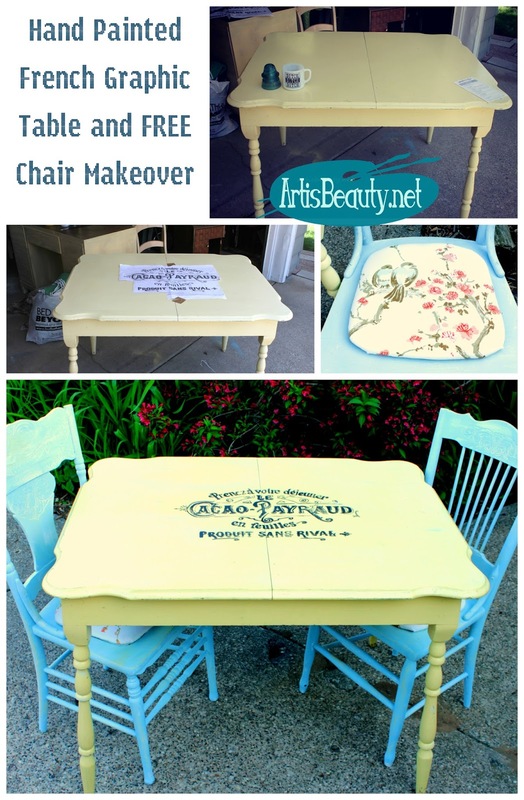 I had painted the chairs in a bored moment with some of my CeCe caldwell paint and recovered them in a different fabric, but when I saw this table, I knew......They need the vintage sheets I had been saving. So I recovered them again and since the sheets are thinner I used and old tshirt as an additional barrier. and covered them with this beautiful sheet I was saving. the graphics fairy that I had been saving. I used my carbon paper to transfer it on and started Painting..
Once it was done drying I distressed it and added some of the blue paint from the chairs in a dry brush technique on the top, to bring it all together. I think they are the perfect fit. Don't you? The tables and chair look fabulous! You won the custom designed stickers from PrintRunner on my blog!!! Please e-mail me with your e-mail address so I can send it to them to get started! Congrats! Very nice! Where do you get carbon paper these days? Yes, they're perfect! Looks just lovely!! How cute, this set would be great in a Lake Michigan cottage; can just imagine myself waking up to the sunrise and sipping on a hot cup o' jo! These turned out just darling! 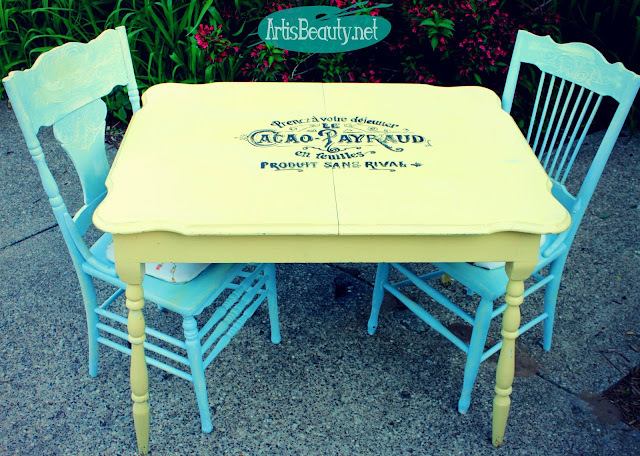 What a great find your sister made with that table - it's the best when you don't even have to paint it! And I think I'd kill for those FREE chairs! Nicely done! I am glad that someone else saves vintage sheets like I do. Love the yellow and blue. The chairs were FREE!?! Our city will no longer let us put free items out on the curb. They actually come by and paint the items day-glo orange and charge a $30 pick-up fee to take the stuff to the landfill! Happy you saved these lovely pieces. Came to visit by way of Domestically Speaking....I'm now a follower! Your table and chairs is ADORABLE!! They look great together. Pretty colors. I "LOVE,LOVE,LOVE" IT!!!!!!!!!!!!! I have a thing for tables, especially little tables. I don't think we can have enough of them! This one is GORGEOUS! I have an old butlers coffee table kicking around here and I want to use THAT GRAPHIC on the top tray! I am just in love with this project, and these colors--I did up my house in these colors for summer decorations, and I really like it! Yet another awesome look! I'm in love with blue and this turned out beautiful! So cute! You did a beautiful job! And I love the graphic! I really want to try one out some time. Just need to find the perfect one. This is a great project! 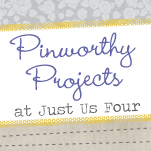 Would you consider linking up to my Pinworthy Projects Party? I hope to see you there! Karin this is so cute, the whole set. Seriously, $14.99? I think they are charging way too much at my Goodwill! Love it! It looks beautiful! I love the way the transfer turned out! Very pretty! Yep - adorable. I've used this amazing graphic too, it's just so effective. Hello, Just love the table and the new look to the chairs - Love that graphic from the Graphics Fairy - perfect! I am glad you visited that I might return the call - and become a follower - looking forward to sharing more! Beautiful table and chairs, you did a fantastic job painting that graphic! I wish my hands were that steady, thanks for the inspiration! That is truly wonderful! What a great job, love it! A match made in thrifted furniture heaven!! Love it!!! It will be at my party this afternoon! Yes, your table and chairs ARE the perfect fit! Love the colors together and the graphic really adds the finishing touch. I'm a Michigander and have never been to Grandville. I'll have to look it up. Hubby and I love to take summer drives in HIS/our Camero so maybe you'll see me at your booth one day. so pretty, karin! i love the color combo with the table and chairs! summery! Thank you so much for linking up to our previous Friday Block Party at Curb Alert! I would love for you to link up again this week and look forward to what you have to share, the link is up and running all weekend. This is by far one of the best table and chair sets I've seen! You have all my favorite elements and colors including the vintage sheets(and coffee mug). LOVE!!!! I must say it has a work of art on it. imagedream offer photoshoot Including wedding photographer, wedding photographers, photo christening, photo books, photo tourist services. Our goal is to create beautiful frames, frames that tell a story from beginning to end. We guarantee that you will receive quality services, with the utmost care and professionalism in everything about the photo shoot photoshoot.